Сейчас идет снег в Font Romeu ?Thank you! Light rain (всего 2.0mm) at first, then becoming colder with a dusting of snow в пятницу после обеда. Freeze-thaw conditions (максимум 3°C во вторник вечером, минимум -2°C в среду утром). Winds decreasing (почти штормовой ветер с юго-юго-запада в среду вечером, слабый ветер с юго-запада к обеду пятницы). A dusting of new snow. Freeze-thaw conditions (максимум 7°C в понедельник после обеда, минимум -1°C в пятницу вечером). Wind will be generally light. Таблица выше представляет прогноз погоды в Font Romeu, сформированный для определенной высоты: 2088 m. Наши уточненные погодные модели позволяют дифференцировать прогнозы между вершиной, серединой и нижней точкой катания на склоне Font Romeu. Чтобы переключаться между ними, используйте линки выше таблицы. Чтобы получить предоставление об изменении погоды в регионе в целом, попробуйте наши Погодные карты для France. My family and I skied Font Romeu in early January 2010. This is an excellent family friendly resort linked to a neighbouring resort called Pyrenees 2000. The slopes are excellent for beginners with greens in abundance. There are not many resorts where you can ski from the top right to the bottom on greens! There are a large number of smooth blues all over and an excellent blue into Pyrenees 2000. There are a number of blacks but these are more red in nature although sometimes icy. Many good pistes for intermediates at the back of the resort and into Pyrenees 2000.The resort is well interlinked with 3 mountain restaurants to allow frequent hot chocolates. We stayed in Font Romeu and found an excellent pub with a central fireplace where one could order food through a 'hole in the wall'. All in all, an excellent family friendly resort with a creche at the base of the ski resort and a linked lift right from the centre of Font Romeu village. We have been to the Pyrenees many times and enjoy neighbouring resorts of Les Angles and Formigueres. For a weeks trip taking in all three resorts is very possible. We would highly recommend Font Romeu for a 3-4 day trip. The Font Romeu skiing weather widget below is available to embed on external websites free of charge. 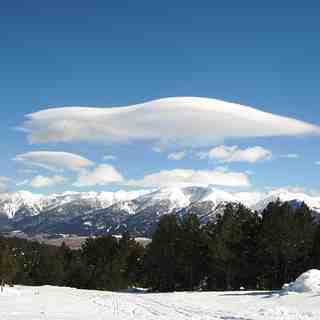 It provides a daily summary of our Font Romeu snow forecast and current weather conditions. Simply go to the feed configuration page and follow the 3 simple steps to grab the custom html code snippet and paste it into your own site. You can choose the snow forecast elevation (summit, mid-mountain or bottom lift) and metric/imperial units for the snow forecast feed to suit your own website…. Нажмите здесь, чтобы получить код для HTML-страницы.